Dear readers, if you are going to appear in the upcoming SSC CHSL 2016 Skill Test/ Typing Test then you must be looking for the SSC CHSL Typing Test Call Letter 2017 that is to be issued soon by the Staff Selection Commission. A large number of candidates who have passed the SSC 10+2 Tier II Exam they are called for the Tier II i.e. Typing/ Skill Test. This test would be of a qualifying nature. Accordingly, the final merit list of the selected contenders will be based on the marks of Tier I & II. In this test, the speed of 8000 key depressions per hour on computer will be adjudged. Only those candidates will be called for this skill test who have successfully qualified the Tier I & II Examination. The skill test will be organized at the Regional Office or other venues as per the commission’s decision. 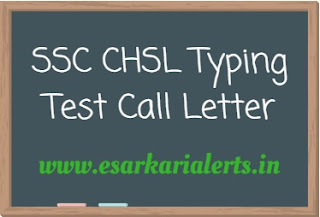 This typing test will be conducted in both languages Hindi and English. The desired medium of examination has been selected by the aspirants at the time of online registrations. The candidates who have selected the English Medium their typing speed should be of 35 wpm. However, the aspirants who have selected the Hindi Medium their speed should be of 30 wpm. The speed will be tested on the accuracy of typing on the computer of a given passage in 10 minutes. To Read More About This Exam, Read the Official Notification.